This large, industrial-looking room lacks intimacy but makes up for it with a laid-back buzz, great people-watching opportunities, and great grub. Whereas the original Caravan (on Exmouth Market) was a small space, with a neighbourhood vibe, this first, flagship offshoot is an altogether bigger, more urbane operation. The large, industrial-looking room lacks intimacy, but has a laid-back buzz and great people-watching opportunities. The ethos is the same in all of Caravan's branches: welcoming, efficient staff and a menu of what they call ‘well travelled food’. Most are small plates – deep-fried duck egg with baba ganoush, chorizo oil and crispy shallots, say, or grits, collard greens and brown shrimp butter, plus a few large plates and (at King’s Cross only) a handful of first-class pizzas. The results are usually interesting: recent favourites include a richly flavoured celeriac gratin with parsley, walnut and a brandy apple topping, and naughty-but-nice crispy fried chicken (in cubes) with jerk mayo and pawpaw salsa (both King’s Cross), and meaty, comforting ham hock croquettes and zingy burmese chicken salad (Exmouth Market). Jalapeno cornbread with chipotle butter is hard to resist from either menu, and it’s always worth ordering a pudding. Breakfast and brunch menus apply the same pick and mix attitude as the all-day one. 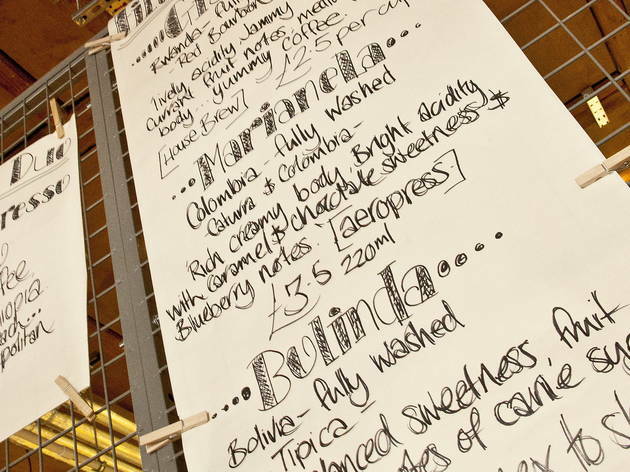 Drinks are equally good, from the global wine list to the own-roast coffee. 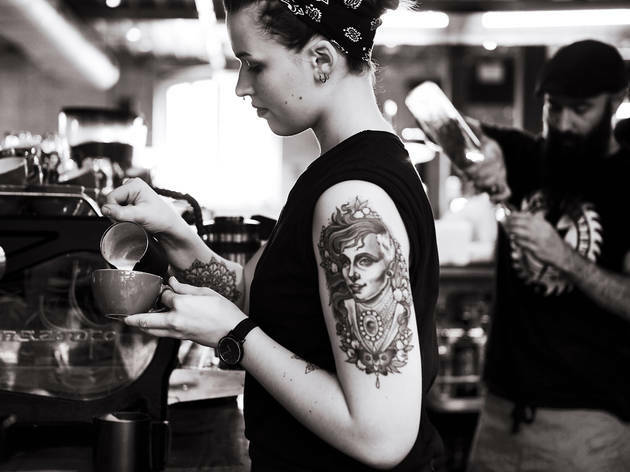 The fruity Caravan blend is perfectly brewed, whether as a textbook espresso or an expertly feathered flat white. The setting, overlooking the fountains of the piazza-like Granary Square, is a further plus. One caveat – we’re not convinced by the unisex loos. After visiting a couple of years ago, and being unimpressed, we thought we'd give Caravan another shot for brunch. What a mistake, surly art student staff studiously ignored us, after we were seated in a draft so persistent that we ate with our coats on. The smoked salmon and new potatoes was basically sashimi with a potato garnish and the baked beans were so sweet that any other flavour was lost in their syrup. To top off that impressive anti-climax we thought we'd sample it's coffee, which boasts great things. Ah we should have learned, it arrived served in a science beaker, luke warm, burnt and was dishwater'esque weak. Completely undrinkable. With enough to fill a tumbler (yes no crockery here) each, at £3 a head it was as underwhelming as the rest of our meal. Brunch for two, for nearly £50, like this... bad show Caravan. We WONT be coming back. I arrived at Caravan this morning and asked if I could sit down for a coffee. I was guided to a table where I then sat for 30 minutes without any service or interaction by any staff. Even when I then packed up all my stuff, and left, I was not acknowledged. Having been a regular dining customer at Caravan in the past, and having filled multiple loyalty cards over the last few months with regular takeaways, I'm really disappointed that I'm now unlikely to feel comfortable buying coffee or food there again. Having had a pleasurable if expensive brunch on my first and recent visit, I returned yesterday at approx. 3pm on a Saturday to have a late lunch at my local eatery. As usual it was full and was advised the wait would be 30-40 mins. I was told I could order a coffee in a random queue near the entrance desk but would have to consume it and wait outside. I looked at the confusing group trying to figure out where to order some coffees. I went back to the person who took my reservation only to find out I had to order the coffees from the person standing next to her. What a convoluted and disrespectful system for accepting diners? A victim of their own success handled by staff too cool for school? I questioned to being 'handled' and 'ushered' in such a slap dash manner and promptly decided not to wait out in the windy cold of winter and save my dosh. Very interesting discord between Time Out's 5* rating and Users 3* experience. I shall think twice about going there again! An amazing setting for what I wanted to be a birthday treat to remember. Working in hospitality myself, I said to my girlfriend as we sat down "I'd quite fancy working here"… not now!! The service was slow even though we were only given an hour and half to eat before the next booking arrived. The menu is very well laid out but you may need to ask what half of it actually is. My starter of balsamic glazed ox tongue was swimming in balsamic vinegar and inedible to even the biggest of balsamic lovers. Giving them the benefit of the doubt, I asked a member of staff to bring me another menu so I could pick something else after my second bite. I was then left till around 4-5 minuets after my girlfriend (not a quick eater) had finished her starter, without anyone coming back to see if I wanted to order a replacement. My main course of duck and bean cossoulet was amazing after they took it back to heat up! However pumpkin, blue cheese and sage risotto that my girlfriend had was warm but very average! On a plus when I asked if the management would kindly take off the inedible starter, they did without any hassle. Although a service charge of 12.5% seemed a little steep considering the inconsistent, slow and unthoughtful attention of the staff. Maybe you should try giving them sections, instead of a free for all and then this could be avoided. A real shame as this place has obviously had a lot of thought in to style but not much into service. Will definitely not hurry back. I want to like Caravan - I really do - but having been there several times over the last few weeks, the service is just relentlessly terrible. The staff ignore you/don't see you/cluster at either end of the restaurant and don't look at their customers. They're often rude, rushed, harried, or simply too cool to care. So fed up of it now - despite the convenience and the good coffee - that I'm going to avoid Caravan in future. Added to which, the food is disappointing. Menus look promising and there are a couple of great ideas (it changes regularly but a spiced cabbage was good, as are their meatballs), but most of it is lacking really standout flavours, and it's executed hurriedly and en masse, meaning that onion flatbread is drowned in yoghurt dressing, or fried chicken cubes have tiny pieces of bone in. I'm not sure it was a good idea, quality-wise if not profit-wise, to go so big in the space at King's Cross; everything seems to have suffered. But it's always packed, so I doubt they're too worried! Until the service and the food improve, I'm sticking to Grain Store nextdoor, or trying the great food stalls along Goods Way instead. So I finally managed to get a booking at Caravan and what a disappointment this place turned out to be! I know that London is not particularly great for service unless you are going to a quality michelin star rated restaurant like The Ledbury for example but this was a joke and I am not surprised to see some of the other reviews on the page. What I am surprised about is that Time Out have it as a critics choice venue? How much are they spending on advertising I wonder. Basically in 3 words- expensive , crap service! Would definitely not recommend it to anyone that prefers to go to a place which can offer the full package - great food, fantastic service and great atmosphere for the equivalent price. Food was goo but portions very small for the price. The service was a bit of a joke. I ordered share dishes for our table of 6 people and the start off ok when they give us the first four dishes but then stopped and left us waiting for 45 minutes. Even though I kept asking the staff where the rest of the food was, they just said they would check. They would then proceed to avoid coming to our table so they would not be asked again. This only made things worse because we could not get anyone to take a second drinks order. Finally I spoke to the fourth waitress that bothered to pay attention to us and she checked on the food, then came back to tell me it would be another 10 mins which was ridiculous. So we told her to cancel it all and bring the bill. Once I said this, all the dishes we were waiting for miraculously appeared on the table and she was behind the waiter carrying the food and asked if I still wanted it all taken back. This was stupid because the waiter with the food completely ignored me when I told him that we had cancelled the rest because of the ridiculous wait and he still put it down on the table and walked away. After having waited for so long we all could no longer eat the food so we asked the to pack it up. She got annoyed at my request and rolled her eyes at while she was snatching the food off the table all angry! When it was time to pay, I said we are not happy to pay any discretionary service charge because of the bad service. Again the looks death we got from all the staff at the cashier desk was enough to make me think that these kids need serious lessons in customer service if they want to be getting £40 pounds extra out of dissatisfied customers. The service charge was £40 on our bill. Again not cheap, crap service, bitchy incompetent staff and no concept of timing with the food when people are ordering only sharing dishes. It's a shame because the few dishes we ate we're nice but the rest just tasted like crap because of the wait and service. Don't recommend it. Think it's fair to say that I had the best smashed avo on toast at Caravan KX. Avocado on granary toast, with pickled red onion, manouri cheese, soy pumpkin seeds, finished off with a poached egg on top.Definitely a winning combination. The restaurant itself was buzzing on a Saturday morning. They don't do bookings at Kings Cross, only walk-ins. The sun was shining, so upon arrival there was a queue, though this was only to sit outside. The atmosphere was good, it is quite loud in there but that is to expected as the dining area is huge. Very lovely space. Definitely be returning, whether to KX or another branch. Overlooking the Granary Square fountain this is a lovely spot for a summer catch up. With a few seats outside, the interior venue is split in half with one end the deli and the other the restaurant. The vibe is very Hackney warehouse meets Covent Garden in terms of the menu. Unfortunately, I was pretty disappointed with the service my group of six had, despite the fact there were plenty of tables we weren’t greeted with any warmth. The menu also wasn’t explained when we sat down, the tapas dishes and larger plates are under the same section so I ended up ordering a tiny -albeit incredibly delicious - tofu dish that should have been ordered alongside other dishes. However, my friend's pizzas were great. The price range is definitely at the higher end but if you’re in Granary Square (and can’t get into Dishoom) this is a nice alternative. I have been wanting to come here for ages, so finally tried it after so much hype about this place, I was a little underwealmed. I liked the hustle and bustle of the place and the decor is very chic industrial. We went on Friday lunch time and it was packed. Service was good, but would say food was only mediocre and nothing I would rush back for. I liked the jalapeño cornbread and the wontons were yummy, the chicken salad tasted of nothing. Glad I finally went, but won’t go back in a rush. 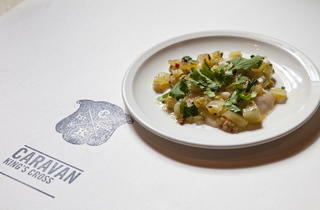 A solid three stars and overall a good meal at Caravan KX. I've been wanting to go here for ages and it was packed out on the day we went. It has a lovely buzz about it and I love the decor. There are also some tables outside if the weather is bad. We found the starter menu more appealing so we ordered lots of bites - cold cuts of meat, cheese board, cornbread, soy cucumbers, stilton wontons.. and a few others. The cucumbers were excellent as were the wontons, the other stuff was good but not particularly exciting. We had a main to share as well- just a chicken salad and it underwhelmed. Service was cheeky but efficient in what I think (at least) was a deliberate way but it was fun to watch. I'd return, and I was happy with my meal, but I wouldn't say I'd rush back - there's better, more interesting food out there. We were heading to Dishoom on a Saturday night (stupidly) and decided we couldn’t wait the 1 hour+ queue. We popped round the corner to Caravan on the chance they had a table, and they’d had a last minute cancellation . . . What. A. Discovery! 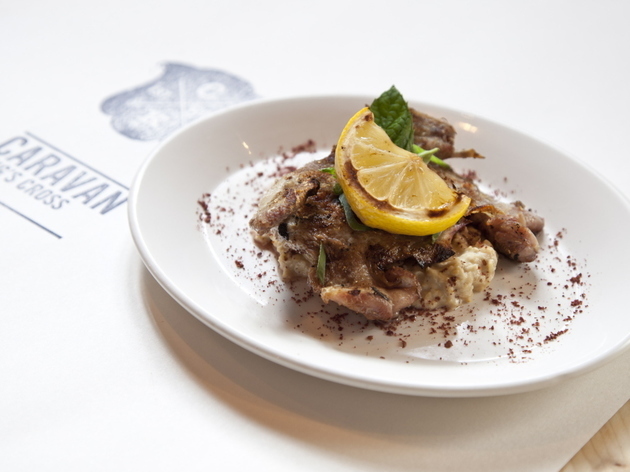 - We eat out in the city a lot, and Caravan brought a refreshing difference and uniqueness to the norm, with absolutely outstanding depth of flavour through every one of its dishes. 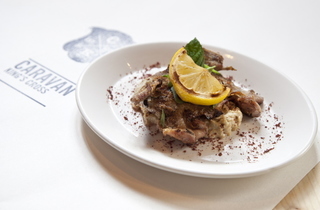 Now undoubtedly one of our favourite places in London, and great to show-off to your foodie-friends who want to experience a different fusion of flavours, without a ‘try-hard’ desperation about the dishes. It’s one of the few places, that I very rarely, cannot make a single criticism of! . 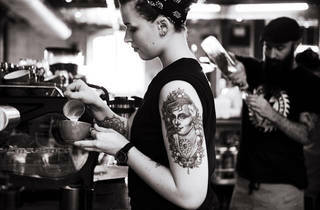 . .
Been to Caravan's Kings Cross a few times for a couple of meals and their coffee. 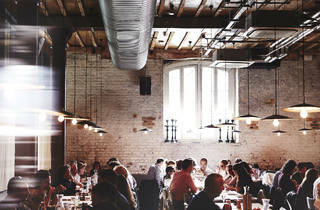 The atmosphere is informal and bustling; the setting industrial chic, due to space formerly being a Victorian grain store (Grade II listed). The service has always been good but the food a little less so. Their food is generally focused on clean eating with healthy options on the menu but they also serve heavier meals, such as pizza. I wasn’t too keen on the pizza I had as the toppings were sparse making it lack in taste, but the salads were good and I’d definitely go back for their coffee. Overall, I find there’s room for improvement. I'd heard a lot about Caravan so it was only right I finally made the effort to pay it a breakfast visit. At the Kings Cross branch on a Saturday morning at 10am we essentially walked straight in and got a table. The queue didn't form until after 11. The space is a large rustic style bustling canteen with friendly staff and sometimes shared tables depending on your 'party' size. The baked eggs with flat bread were pretty tasty, if a little on the sweet side. The avo on toast with poached egg did come with just the 1 egg but was a delicious light option. I had a wheatgrass shot for some goodness which was citrus and spicy in flavour, there's a large selection of herbal teas and coffees. Prices were what you'd expect given the hype and location. I'd definitely come back to try some of the more exciting options on the menu! More lunchy options are available on the brunch menu from salads to meat dishes. You won't be disappointed. 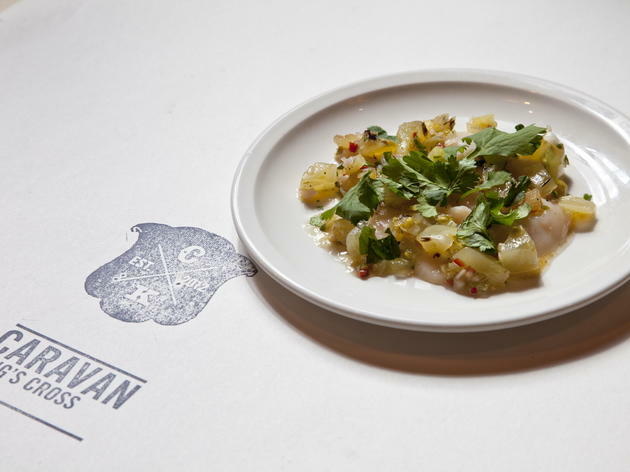 Caravan, located in the beautiful Granary Square, is a real feast for the senses. It's buzzy inside, with a mix of large groups around huge feasting tables, and little snug tables along the edge. The ambience is great but the acoustics make it hard to hear at times, and the closeness of all the tables means you get a little barged now and again - though mostly this all adds to the feel of a buzzing canteen. The cocktails are anything but canteen quality. I went for the chef's margarita which was a blood orange base garnished with cumin seeds which perfectly offset each other. 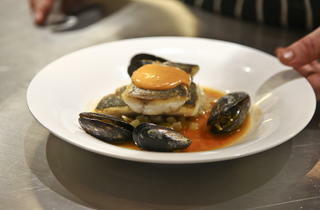 The food is all a jumble of ingredients and flavours in a mix of small and large plates. I thought I had a higher than average food IQ but I was left baffled by some of the ingredients and had to consult Google a few times. Ultimately as a table we settled on a few small plates - the jalepeno cornbread packed a real punch - with a few larger plates and a pizza thrown in for good measure. The anchovie pizza was good but scrimped slightly on the toppings, though the caper mayonnaise style topping really worked. The wine was good quality and had a large option and we ended the evening with a bottle of champagne which was excellent and for £50 a decent price for a high quality champagne. The service was friendly but occasionally hard to summon and a little distractible. We went on a Wednesday evening and I don't know if I'd brave the place on a weekend - space was already hard to come by! All in all Caravan is worth a visit if only to delve into their food choices (swan smoked salmon? Still not sure what it meant but it was great!) and sample a few cocktails. The food is tasty, but very heavy. Visited for brunch and it was absolutely heaving and very noisy - not a place for a calm weekend brunch. I was impressed with the flavour of the barbecue baked beans, but could have easily cut the portion size by half. Overall, it was an okay experience and I agree with a previous poster - it's a little overrated. I love the pizzas here, but more importantly, came here on a Saturday night, it was packed, but the weather was so nice and warm, so we managed to get a table outside. The staff were super friendly and very accomdating with such a large group. I ordered the small plates: Baby Kale with truffled umeboshi, percorino. Chargrilled Scallions with ajo blanco, romesco abd coriander. Grilled English Asparagus with stilton, den miso, thai basil and shiso. All three were delicious but I particulary enjoyed the charred asparagus and the tangy baby kale salad with a variety of green leaves, matched perfectly well with the charryness of the asparagus. Ended the meal with a Coconut panna cotta with passion fruit jelly, coconut yoghurt and toasted coconut. It was sublime, just what we needed to cut down on the savoury bitterness of the scallions. It was a bit tart due to the passion fruit but matched really nicely with the coconut yoghurt. The rain was about to set in, so we were then escorted inside where a table was waiting for us. Can't wait to go back for some more tantalising goodies! Went here for brunch a few weeks ago. The menu looks great, but I cannot comment on the actual food as I never got to try it. I ended up walking out after ordering due to the service I received being awful. Review based on a first experience - Sunday brunch. Food wasn't good. "Clean eating" vibe throughout the menu, which is not a problem if done well. Ultimately disappointing flavours, odd combinations and quality of final dish finish. Based on this experience suggestive of style/ trend over actual taste. Not one for true foodies but I'm willing to give another chance off brunch. A really good option for your Sunday brunch. It's very crowded and you should be prepared to wait to be seated. The food is very good though and I recommend the baked eggs with tomato and pepper ragout - if you do get that, make sure to add the merguez sausage! The service was good and the prices were very reasonable. A last small recommendation is to order a coffee to-go before you leave - there is nothing better than to enjoy it by the canal if it's sunny outside! The place to go for brunch in King’s Cross! I am totally in love with Caravan! I had lunch there last Saturday and I could have spent my afternoon there if I had an extensible stomach. First of all, the brunch menu is original and atypical; I was a bit fed up of my poached egg avocado toast every weekend, so Caravan is a breath of fresh air. It was pretty long to make a choice as I wanted to try everything! I love sweet potatoes but I am crazy about aubergines, so the choice was hard! I finally opted for a sweet potato and cumin waffle, with mango and coconut, and some cucumber sour cream. It was really good, the sweet and salty were marrying really well. I shared a chocolate dessert with my friend – D I V I N E! I am still dreaming of it. The place does not allow booking during the weekend brunch, so expect having to queue. We waited 45 minutes for a table when arriving at 1:30. We waited seated in the back room, and the waiter started bringing us hot drinks and was making sure everything was ok. Their hot chocolate is worth the detour, delicious! I absolutely recommend the place for a brunch if you are around the area, and if you are far away, don’t worry, they have other branches. Been there multiple times to kingsX and exmouth market, I definitely worth a visit. Cool vibes, menu & cocktails. The only downside is sometimes it gets rather busy, & you may have to wait for a table. It's also easy to rack up a bill when you aren't paying attention. I'd heard good things about Caravan, so booked up well in advance for a birthday dinner. 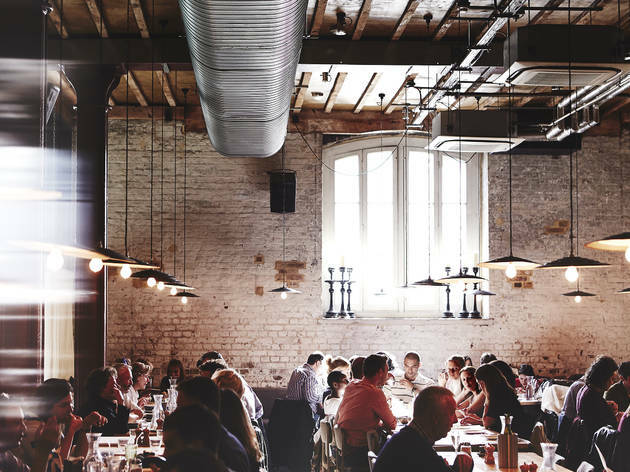 The building at Kings Cross is really cool - the place has an industrial, canteen vibe, but the downside is that it was quite loud - I wouldn't recommend it for an intimate, romantic dinner, as the tables are quite close and it is very open plan. The service was great, we had a very friendly waiter who was really attentive given how busy it was. We picked a variety of dishes from the menu to share between two and the Beef Carpaccio was undoubtedly my favourite dish (see pic below!). Overall I'd say Caravan was a bit overpriced for what it was. It's one of those places that has gained quite a lot of hype and a reputation as somewhere cool to go, but you could probably find a better, less busy, independent restaurant somewhere in Kings Cross, with food that is just as good. Fantastic coffee, delicious brunches, great location and atmosphere. Love the coffee, the food, the atmosphere. On the outset I loved Caravan's decor and ambiance - its a beautiful industrial restaurant. The menu sounded modern and super delicious - we went for the small plate options between 4 for us. Some of the dishes were delicisious. But the food seam to come very quickly which made me feel like it had just been microwaved - but overall the food was nice. We had a variety of dishes - included crab (which wasnt super fresh) chorizo croquettes, cheeses, artichoke hearts and salmon. The service was much to be desired - the staff were not very well educated on the menu and they were not very attentive at all. This was a real shame as I had high hopes for this restaurant. Caravan has been known to serve one of the best coffees in London, but when it comes to food, I thought that this would also match. Unfortunately, it might just have been me being my greedy unhealthy self, but I found the food bordering on the bland and overly boasting "health" and "organic". Maybe this is a trend (see l'arperge in France which is also kicking off a vegetable focussed meal) that is going to take off but for me I really did not enjoy it as much as my 2 companions. Overall, the experience was pleasant as the setting made for a nice dinner and the location was fantastic. Whether I would go back or not would really depend on if the menu changes dramatically, which I heard they do since they use seasonal ingredients. Maybe I just wasn't ready for that season... Not my favourite but not something to avoid. I was looking for a nice sun trap to make the most of the hot weather and Caravan delivered! The Waiter advised us that it would take over an hour to get a table but sorted us out with a nice bottle of rose to enjoy in the sun whilst we waited. It only took around half an hour to be seated at an outdoor table for 4 in the end. The food was delicious - we took the advice of our waiter and took 2 dishes each and a pizza and all shared. My particular favourites were the crispy pork belly which was crisped to perfection and the cheese Beef carpaccio with delicious crispy bits. Took a few friends here last weekend for brunch as they were staying close to King's Cross. I heard about it a lot, and I have to say I was impressed by the atmosphere - the place is buzzy, industrial, very cool (my friends absolutely loved it). We were seated in about thirty minutes (we didn't have a booking and staff was very friendly with us); service was a bit slow. Coffee was really good, and food was delicious too, although prices are quite high. The avocado/chilly/poached egg on sourdough is really good, I loved it. One of my friends had quinoa porridge and made me so jealous, it looked soooo good! It's a place I would go back to if I'm around the area but wouldn't go there on purpose. Good brunch if you're around King's Cross, try and book a table if you can as it's quite busy all the time! Going here today for a first date was a fairly good choice. I had already made a reservation so we were seated quickly and no one looked down on us for ordering tap water. I ordered two of the small plates, while my date had one of the larger dishes. We both opted for a cocktail, dessert and a coffee because our conversation was flowing rather freely. Thankfully the staff didn't interrupt us but rather came in to take the order and bring the food with good timing. The main dishes arrived really quickly whereas the dessert took a little more time. The menu has an interesting combination of flavours and textures, especially the squash dish I had. The paper table cloth is a little drab and the cocktail glasses are rather small but everything else was pretty good. The reason the rating isn't higher is due to the pretty big price tag and that we didn't really get a feel for the restaurant's personality. I like to have conversations with wait staff especially when struggling to pick a dish. It was also unusual to be served by so many different people instead of one person throughout the meal. They were quite relaxed with us leaving the table, allowing us to keep talking for a while after paying the bill. Overall, I like Caravan, but I prefer it more as a pit stop just for coffee or dessert rather than a destination. I visited Caravan to buy a bag of coffee,actually! 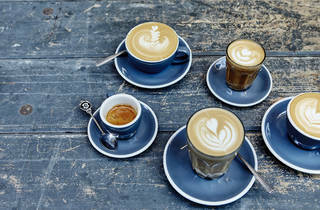 I was out on a day in Granary Square with my man and we thought- lets buy some fancy coffee to take home. My first impression of the place was,yeah I like it. I saw lovely brunch dishes being served, a bountiful avocado on toast,eggs and sausages in a bowl and the like. It looked yummy and the people eating seemed happy. It was a brisk afternoon in the place and the staff were more than happy to help and direct us to their coffee section. 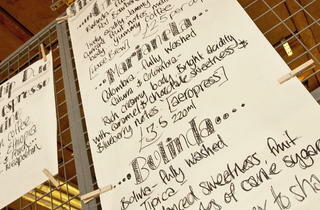 Lots of different coffee's to buy and some snazzy equipment,should you want that too. I have to admit the coffee was £8.50 a bag and the coffee was ok. It has a nice taste to it but it was a bit too passive for me. It had some good notes to it and very drinkable but didn't have the kick that I like with my coffee. I would go and have some food there,it looks good fun. I think it's a good place for a bite and a coffee. Nice settings,pleasant staff and an air of trendy throughout. Caravan has an excellent reputation on the London food scene, and for good reason: this place churns out a fantastic range of dishes, and their coffee beans are some of the best in the city. Caravan is particularly outstanding when it comes to brunch: expect a few healthy options along with intriguing things like kimchi pancakes and baked eggs. It's also perfect if you just want somewhere to settle down with a hot drink and a book. My only criticism of Caravan is their portion sizes. I'm not someone who needs a lot of food, but I do tend to find myself wanted more whenever I go here. Then again, that's as much a compliment to the chefs as it is a criticism. I do love the brunch menu at Caravan but I'm not loving the KX venue - more recently the wait is getting longer and the staff on the door aren't especially hospitable or friendly. We were told the wait would be 45 mins - we gave up waiting after 50 mins and went down the road to German Gymnasium which was fab. The main reason for me coming here was to get my hands on some Acme coffee cups. The large industrial dining area was not what I was expecting. It was really busy and buzzing. Upon entering we asked if we could get a coffee and the waitress just pointed us to the bar. There really wasn't much space for enjoying a coffee in the coffee section - we ended up sitting on chairs of the wrong height at the bar with our knees banging into the sides of the bar. 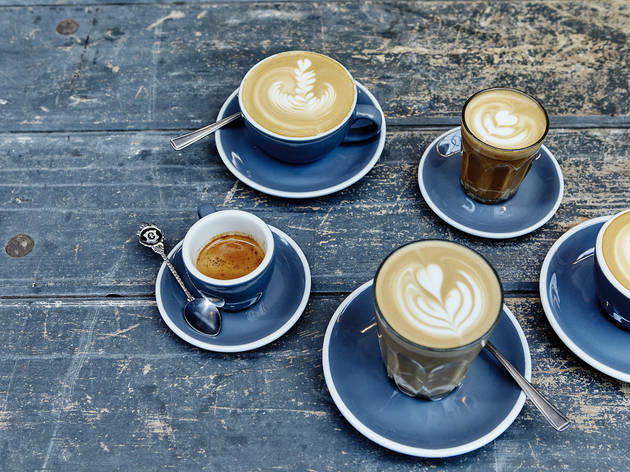 I first got a taste of their coffee when I was at Freestate Coffee in Holborn and instantly fell in love with it. I was expecting to get a full-bodied delicious flat white but instead it was a little watery and bitter. The fruity hot chocolate was a lot better. The cardamom-laced ginger cake was too sweet and a little dry. In contrast the orange and almond cake was moist and tasty. I got a couple of Acme coffee cups and a bag of coffee beans to take away. Service was good and the food was delicious. The place had a cool vibe, with funky Motown tunes playing in the background, the decor was underdone chic. Brunch was about £20 each for 2 courses and drinks, which is pretty good for Granary Square. Very enjoyable, highly recommended for a leisurely brunch. I have been to Caravan Kings Cross twice and both times failed to actually place an order. The first time we were seated outside and ignored. Other customers left without paying, as they gave up waiting for any service. Having failed to get served at all, my friend and I decided to walk to caravan ex mouth market as it would be faster. The second time, today, I was told I could only have a table for an hour. This was fine as I wanted to eat quickly and go back to work. I was seated and ignored for twenty minutes. The service I have witnessed is rude. Nevertheless rude service is at least service. Give up. Don't bother. I really feel that this place is over hyped. However I think it is worthy of all the hype. The food, service and ambience are superb. I love sitting at the bar and soaking up the atmosphere while grabbing a bite to eat and watching the bar staff working hard. If I lved or worked in Kings Cross I'd be there all the time. Superb pizzas, excellent customer service. Have been here several times for the pizzas which are just excellent. Good base, delicious fresh, juicy toppings and a good selection too. Was a really busy night so we sat up at the bar which was fine. Ordered dessert which took ages to arrive – in fact it was the barman who pointed out the delay, got his colleague to pop to the kitchen and check, assured us it would only be a few minutes and it was then brought over by the manager who told us it would be complimentary due to the wait. Exceptional service! Other places could learn a lot from this. Would happily return again and again. Fabulous! Such an overrated spot. Neither My husband nor I enjoyed our breakfast dishes here. I guess the quality of food here drops the more crowded it gets for brunch. Interesting and unique flavours (one of the places I have to google / google translate every single word on the menu), very good service and marvellous industrial style interior design. A vibrant place for a Sunday brunch, in my opinion a bit overpriced though. Great spot and amazing food. Causal relaxed group and friendly staff. I like that while you still may have to wait at the bar, there is plenty of space and you do not feel cramped while you wait for your table. Menu is varied but the specials are always delicious and breakfast menu is an impressive as the dinner options. My friend and I treated ourselves to brunch here last weekend and again we were so impressed with the food and service. We arrived at 10.45 without booking (not sure if you can book?) and knew we would be up for a wait. They took our number and we ordered a coffee to go and sat outside in their outdoors seating and chatted/ played cards til they called us (we were in no rush) but just be warned on the weekends you're going to have to wait to get a table! While we waited we looked at the menu so we knew exactly what we were going to get when we sat down! Exactly 45 minutes later they rang us so we dashed inside and were seated right away! As there was so much on the menu to try we decided to share everything and get one dish at a time. To start we ordered the kimchee pork belly pancake which was sooo good! Pork was delicious and full of flavours. Pancake isn't so pancakey but tasty all the same. I couldn't have eaten the whole thing though! We also ordered the apricot mimosas which were good but nothing amazing! Next up was the pumpkin waffle with ricotta, peppers, pecans and maple syrup. I thought this dish was going to more of a sweet dish but it was actually savoury! Interesting flavours and worth trying but again couldn't eat the whole thing. Finally we had the coconut bread with lemon curd and strawberries! My favourite by far! Would definitely have again to myself! Overall had a lovely brunch - the waitress was very friendly and we weren't rushed at all! Will definitely be back for brunch but looking to try the bbq beans and the baked eggs next time! 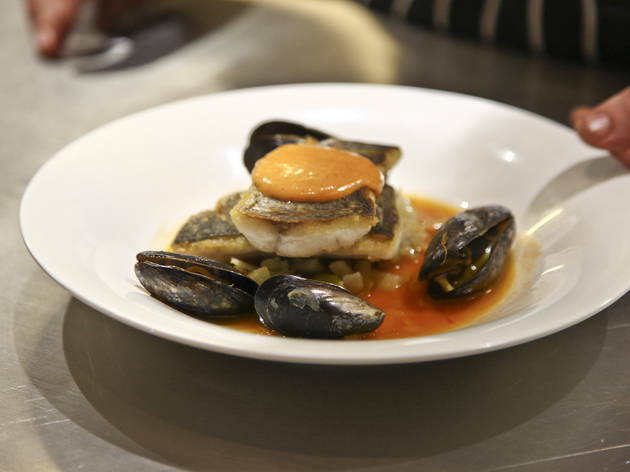 Service is a bit mixed but generally the food is good and there is always a good buzz to the atmosphere. I've been a few times for brunch and the poached eggs were great but I've never ordered anything more complicated. They did mess up the drinks order but were helpful when we chased it up. A good place to go if you live locally and aren't under any time restraints but not worth a trek across town. Beef Wagyu was truly excellent and Lamb Tagine wasn't bad either. Great atmosphere, attentive yet relaxed staff and a creative cocktail list - Expresso Martini is a must-try. The toilets were mixed, the door didn't lock, not good especially when a man can walk in. Not enough soap dispensers, lentil and fish main was good but small for the price. Scallops, goats cheese salad, quail and ricotta pizza were all mediocre. average small plates, good pizza. will go back and try the brunches. very nice space, good for a casual dinner with friends.